our saturday morning workout started with bear crawls! ONE on ONE prenatal training sessions are available! email me for details at le@fitfoodiele.com. if you'd like to have the fittest pregnancy possible (or know a mama that needs one) it's my pleasure and purpose to show you how. 'thank you for finishing your call before ordering.' you tell'em, Salata. vegetarians, vegans, and gluten-free peeps unite! i started with a salad and i wanted to go big. really big. post workout 'hangry' BIG. i love that the calorie count is listed for every.single.item, right there in front of you. i jokingly told the sweet girl who took my order that i wanted a lil' bit of everything and she responded, 'ok!' with a smile and got her scoop on. mind you there are like 50 different things you can build your salad with, people! you don't pay by weight at Salata; everything is portioned out reasonably by the server. look at all that gorgeous, healthy color! dressing on the side, you know it. that Chipotle Ranch though... don't say i didn't warn ya. i wanted to drink it. i got a small side of it along with the fat-free mango dressing. if you'd like to sample one first, just ask. protein! i went with the seafood mix which is a scrumptious combo of herb marinated salmon, krab, and shrimp. those three proteins are available individually along with these choices: baked tofu, quinoa, falafel, pit-smoked turkey, asian BBQ chicken, pesto chicken, spicy chipotle chicken, and herb marinated chicken. complete nutritional stats and ingredients are available on their website. avocado is extra but get it anyway!!! you're worth it. and/or one of these sweet treats for just a buck. i found Dego and i a quiet corner of the restaurant so i could do my Periscope thang buuut, as usual ya girl couldn't catch a signal. womp. man i love the app so much though! i just wish i could get a gauranteed signal whenever the moment to broadcast strikes. i am not a fan of scheduled scopes (or super crazy long scopes that you can't fast forward through lol), so maybe i'm finally accepting that 'winging it' is just my thing. just know it went down. on my way to finishing the entire bowl. i just couldn't stop. i picked up my goodies and headed home to get ready! my lopsided bun and i were on our way to Michelle's house with the Salata Bar in tow. the ladies circled the island like sharks while i took pictures, haha. twice in one day. ok, 3 times cause i took the leftovers home and ate again. the Salata Bar was perfect for us, but there are a few more catering options to choose from including Wrap Trays, Boxed Lunches, Salata Bowls or you can customize a combo package. what a fun night; all the ladies raved over how delicious, fresh, and healthy everything was. they also now want to order cases of the Chipotle Ranch dressing!!! 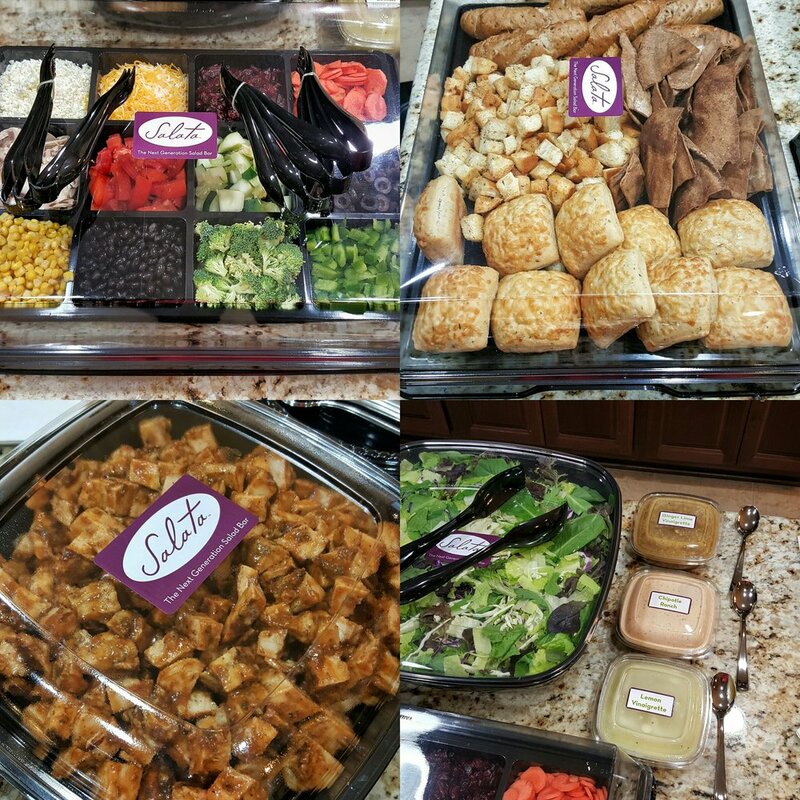 if you're in the business of hosting parties, gatherings (family, friends & professional) then the Salata Bar is convenient, highly recommended, and fitfoodiele approved. Q: would you rather actually go out for a girls night, or stay in?